If you missed the Kickstarter, you can still order all the items from my fall bundle. Head on over to the store and check it out! You can also see the titles I’m distro-ing through The Tiny Report. 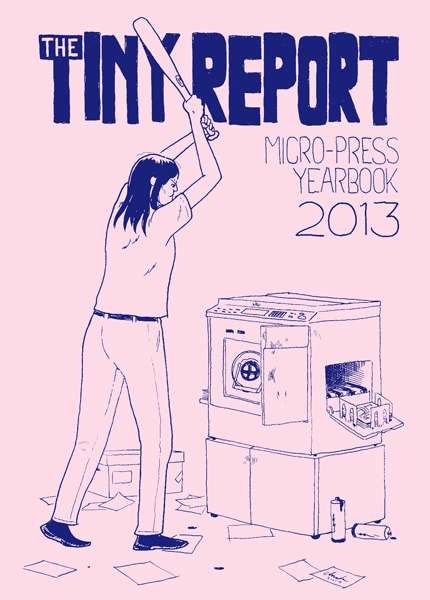 Limp Wrist, the Micro-Press Yearbook, and the Preston Spurlock screenprint are also available at Desert Island. I’m trying something new! I’ve been jealous of micro-presses like Oily or Youth in Decline that offer bundles or subscriptions. I’ve never had my act together enough to release a “fall line.” But this year is different! I’m releasing three handmade items this September: a comic (Limp Wrist by Scout Wolfcave and Penina Gal), an untitled screen print by Preston Spurlock, and a zine by me (The Tiny Report: Micro-Press Yearbook 2013). I’ve just Kickstarted this, so check it out!